Remind your daughter that she will always have your love and support with this poetic sterling silver piece. BB Becker's poetic pendant captures parents' profound love and dreams for their little girl. 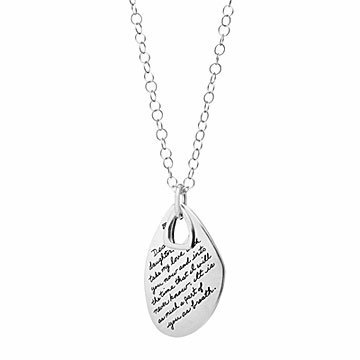 Each piece is engraved with the handwriting of the artist's wife Josephine, adding a personal and intimate touch to this sterling-silver necklace. Whether given to your daughter as she departs for college, moves across the world, or begins a new chapter in her life, this heartfelt piece will remind her that no matter where life takes her she will never be without the love and support of her parents. My daughter thought it was beautiful. Love Love Love this Dear Daughter Necklace !!! I think it's very pretty & has a very meaningful sentiment. I also liked the way it was packaged. My daughter cried when she received this necklace. Was a gift for my daughter. It is unique and meaningful. This will always say what I cannot when I am gone. This was a special gift for my daughter. This gift sends a message can be often read and remembered rather than said. This necklace means the world to me!